Wander through the bookstore at the Imperial War Museum and you're likely to spy a book entitled Horrible Histories - Spies. 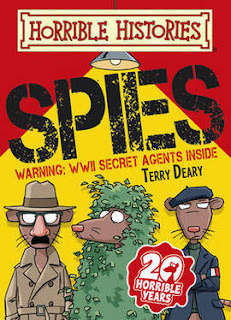 It's a children's book designed to awaken young minds to the horrible history of World War 2 espionage. It does a rather admirable job. On 14 May 1941 German spy Karel Richter dropped into England on a parachute. He buried the parachute. Sadly crackpot Karel also buried his food supplies by mistake. After two days he was ill with hunger and the police caught him when he was taken to hospital. He was hanged. At least he didn't die hungry. A few factual errors (date and method of his capture) but on the whole, the account is accurate, and designed to illicit a rueful laugh from the reader. Mind you, after a while, the word play becomes a bit annoying, at least to an adult reader. It might still illicit guffaws and knee-slapping (or LOL's these days) from younger readers. 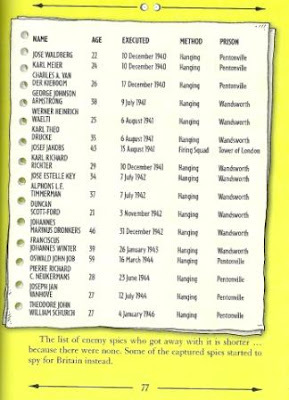 On page 77, in a chapter entitled Dead Wrong, the authors note the list of enemy spies executed in Britain during World War 2. The list of enemy spies who got away with it is shorter... because there were none. Some of the captured spies started to spy for Britain instead. This is, naturally, not altogether accurate. There was at least one spy who escaped detection, Jan Willem Ter Braak (Engelbertus Fukken) and rumours of several others still float around the internet. On the whole though, if you have a young person whom you want to interest in WW2 espionage, this book is a good start. You also might want to check if the Imperial War Museum still has its exhibit on Horrible Histories - Spies up.